To decide whether fish oil is right for you, you need to know which nutrients your body needs. The best way to discover this is through a blood analysis service, such as InsideTracker, which measures key blood biomarkers and then provides nutrition recommendations based on a database of over 7,500 foods. 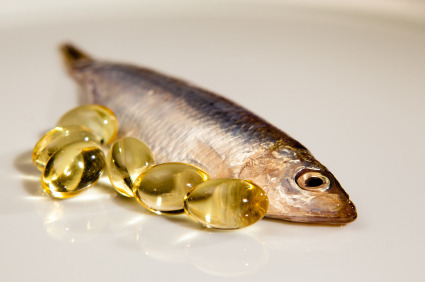 Read on to learn more about fish oil and whether it deserves a place in your grocery cart! Omega-3 fatty acids are a type of dietary fat; specifically, they are a polyunsaturated fat (PUFA). Research shows that eating foods rich in polyunsaturated fats improves triglyceride and blood cholesterol levels, and may help decrease the risk of heart disease. Polyunsaturated fats may also protect against irregular heartbeats and help lower blood pressure levels. Omega-3 fatty acids are essential fats; as the body cannot naturally produce these essential fatty acids, it is necessary to obtain them through either diet or supplementation. Click here to find out what others foods contain high amounts of omega-3 fatty acids, and how InsideTracker can help you optimize your diet! Fatty fish like mackerel, tuna, salmon, sturgeon, mullet, bluefish, anchovy, sardine, herring, trout, and menhaden are excellent sources of omega-3 fatty acids, providing about 1 gram of omega-3 fatty acids per 3.5 ounces of fish. In addition to being a great source of omega-3 fatty acids, fish is a good source of protein that does not contain high amounts of unhealthy saturated fat, unlike many meat products. There are also plant sources of omega-3 fatty acids. While fish oils contain docosahexaenoic acid (DHA) and eicosapentaenoic acid (EPA), plant sources provide alpha-linolenic acid (ALA), which is converted into omega-3 fatty acids in the body. Studies have generally used fish oils to examine the effects of omega-3s. While plant sources with ALA may provide the same health benefits as DHA and EPA, not as much is known about them. What are the health effects of taking fish oil? You can boost the amount of omega-3 fatty acids in your diet by increasing your intake of fish or by taking a supplement. This is good news, as omega-3s play an important role in brain function, normal growth and development, and in preventing inflammation. Deficiencies in omega-3 fatty acids have been linked to a wide variety of health problems including cardiovascular disease, certain cancers, mood disorders, arthritis, and more. Still, it may be possible to have too much of a good thing. For example, a study published in July 2013 at the Fred Hutchinson Cancer Research Center in Seattle linked eating a lot of oily fish or taking potent fish oil supplements to a 43% increased risk for prostate cancer, and a 71% increased risk for aggressive prostate cancer. Because of research like this, some experts take the position that the government should establish a dose limit for DHA. Overall, evidence linking fish oil to cancer has been mixed—some research shows that diets high in fish oil or fatty fish may reduce the risk of certain cancers, while other studies show no such connection. Should I eat fish oil? While there is no standard dose for the amount of omega-3 fatty acids that you should be consuming, the American Heart Association (AHA) recommends that people with heart disease take 1 gram per day of EPA+DHA. Higher doses — between 2 to 4 grams per day — are used to lower triglyceride levels. The AHA also recommends that people consume at least two servings of fish per week. According to the National Institutes of Health, fish oil is likely safe for most people, including pregnant and breast-feeding women, when taken in doses of 3 grams or less per day. High doses of fish oil may reduce your body’s immune system activity and its ability to fight infection (the U.S. Food and Drug Administration classifies intake of up to three grams of omega-3 fatty acids from fish daily as safe). It is also important to note that consuming large quantities of fish can expose you to mercury and harmful industrial or environmental agents (fish such as shark, king mackerel, and farm-raised salmon are more often the culprits). Removing the skin and surface fat from fish prior to cooking can reduce potential exposure to some of these contaminants. We don’t know yet whether the benefits of fish consumption come entirely from omega-3s, but it is more than likely that all of the fats, vitamins, and minerals found in fish are involved, rather than just the EPA and DHA alone. While expert opinion may remain divided, it is best to speak to your doctor about omega-3 fatty acids. It is also important to get your blood tested in order to make sure that it’s safe for you to consume. In general, you may be a good candidate for fish oil supplements if you have high cholesterol or high levels of inflammation in your body, which are biomarkers that the InsideTracker program monitors very closely.